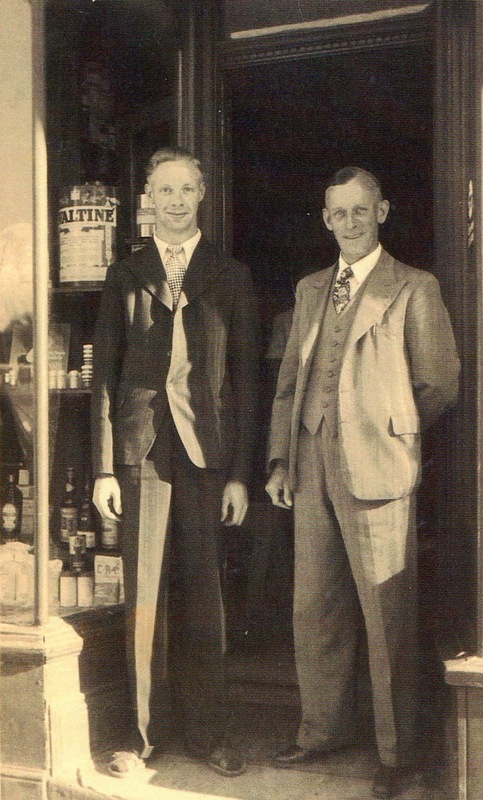 Cecil Hawkeswood, seen here on the right, came from Quarry Bank and qualified as a pharmacist in 1921. He came to Wollaston in 1928 and opened his shop in Bridgnorth Road. He eventually built up a chain of six chemist’s shops in Stourbridge. He and his family lived over the premises until 1938 when they moved into a house at the bottom of Meriden Avenue, almost opposite the shop. In the 1960s he bought the premises next door and the enlarged shop and his first one can both be seen on this site. In this photograph he is seen with his son, Bob, who carried on the business after his father’s death in 1984. He retired in 1988. Thats ma Dad and Grandad. Corrrr! Cecil was my great uncle! Harry Hawkeswood was my grandfather.